Register for Mother's Day 5K today! 9:00 am start, checkin begins at 7:30 am at FDR Park Parking Lot #1. Family Registration: $50 for up to 4 people, $10 per person after that. This year’s race is being presented in conjunction with No Child Wet Behind to benefit the Westchester Diaper Bank. No Child Wet Behind is a 501c3 dedicated to awareness, education and the donation of diapers to needy families with infants and small children. 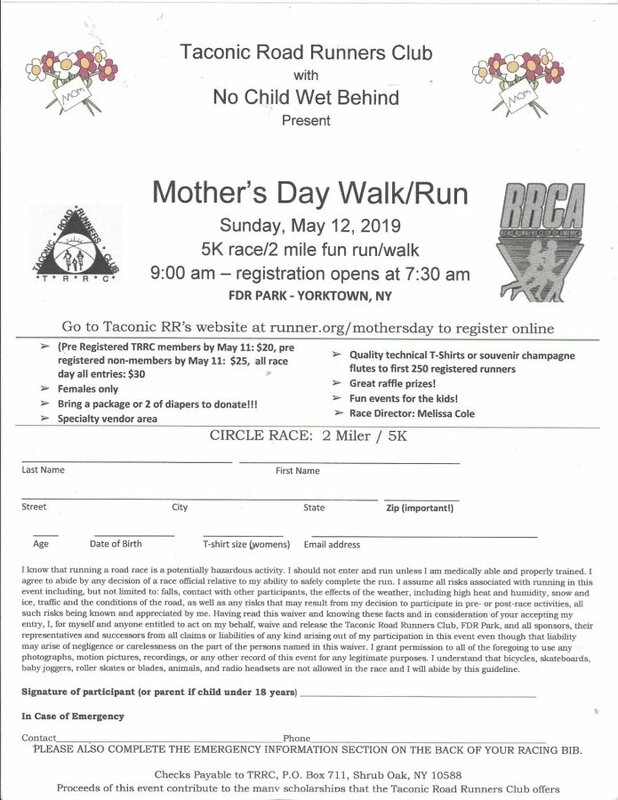 Please bring a package or two of disposable diapers (open packages of diapers are welcome) on the day of the race to donate to this worthy cause. This year there will fun for the kids including a bounce house, face painting, crafts and more. There will also be vendors to visit while waiting for the start/results.